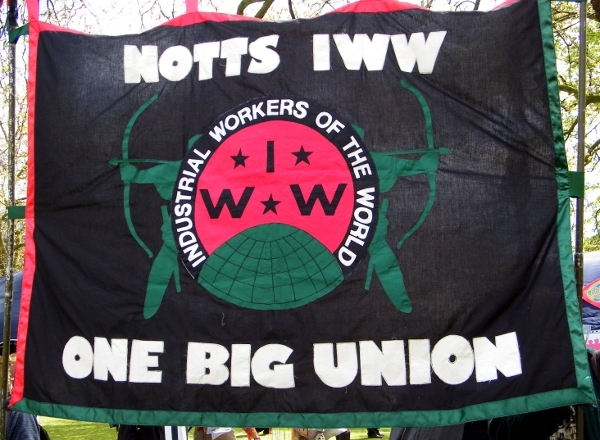 Hot on the heels of the recent upsurge in IWW activity in other parts of the UK and Ireland, IWW members in Nottingham are holding a series of events to kick start union activity in the area! The first will be on Saturday January 26th at the Nottingham Trades Council march and rally. The rally is focused on anti-austerity and low pay / unionisation issues for precarious workers. Facebook event page here. We are going to meet at 11am at the Brian Clough statue on King Street, about 25m from Market Square. Please look out for the IWW banner and stall. We will participate in the march and rally and then do some IWW outreach for an hour before having a debrief and some well earned refreshments! Secondly, on Tuesday January 29th at 7.30pm in Nottingham Mechanics (3 North Sherwood Street, Nottingham, NG1 4EZ) we will be holding a public meeting in the Lecture Room to discuss the union and re-booting activity in the area. Russ Spring the IWW Regional Secretary for Wales, Ireland, Scotland and England will lead a discussion on the IWW and the unique space we can potentially occupy in the UK labour movement. Right now is a great time to get involved in the IWW and we would encourage all current, past (and potential future!) members to attend!